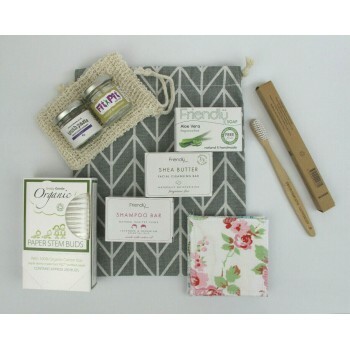 The Cloth Mama bathroom set has been carefully curated to help you on your journey to plastic free self care. It includes many of the daily basics so is a good starter set. 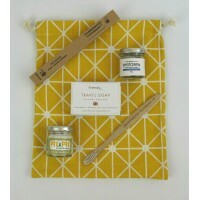 Worth over £32 if bought individually, this set is great value and would also make a fantastic gift. Fit Pit Woman 25ml natural deodorant. 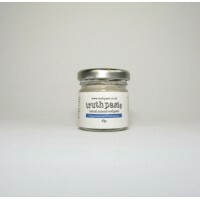 Truthpaste Fennel 40g natural mineral toothpaste. One adult size Environmental bamboo toothbrush. Friendly Soap Shea Butter 95g facial cleansing bar. Friendly soap Aloe Vera 95g soap bar. Friendly Soap Lavender and Geranium 95g shampoo bar. Set of 5 Pretty Period cloth makeup removal pads. Simply Gentle organic paper stem cotton buds (200). 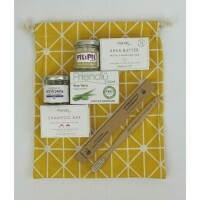 Cloth Mama linen soap pouch. Cloth Mama linen drawstring bag. Bought separately this set if worth over £32. All items are contained in recyclable or biodegradable packaging and contain no plastic. Each product is also vegan, cruelty free and suitable for sensitive skin. 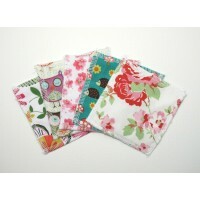 This set of 5 handmade wipes are just perfect for removing makeup and are a good size too. The patte..